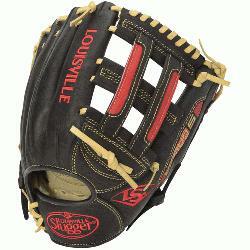 The Omaha Series 5 delivers standout performance in an all new line of Louisville Slugger Baseball Gloves. The series is built with premium Cambio leather in a full range of professional patterns, perfect for players moving up into the higher levels of baseball. 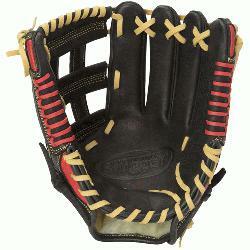 This Omaha Series 5 11.75 Inch Ball Glove Features Premium Grade Cambio leather shell. Unique Edge-Lace design for additional stability. Full grain leather palm lining. Premium lacing. 11.75 Inch Infield pattern. Open Back. H Web. One Year Manufacturer's Warranty. Louisville Slugger has sold more than 100,000,000 bats, making it without question the most popular bat brand in baseball history. Louisville Slugger continues to dominate the game in both wood and aluminum bat categories. 60% of all Major League players currently use Louisville Slugger. And in the past decade, seven national college baseball champions hammered their way to the top with Louisville Slugger TPX bats. In recent years, Louisville Slugger has gone far beyond bats, providing performance technology in the form of fielding and batting gloves, helmets, catchers' gear, equipment bags, training aids and accessories. In addition to its on-field performance products, Louisville Slugger offers personalized, miniature, commemorative and collectible bats.